Cafe Mezzanotte now offers free rental on LCD projector and screen for private room only. We also offer laptop connectivity. Call to make an appointment, so we can create a custom package just for your group. 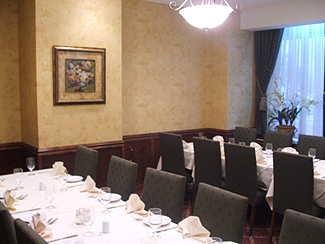 We have a private dining room that can accommodate up to 20 guests. Whether you are looking to celebrate a special occasion or entertaining out of town clients, we customize our menu and service style to meet your needs. Book your next business, rehearsal, or birthday dinner with us!